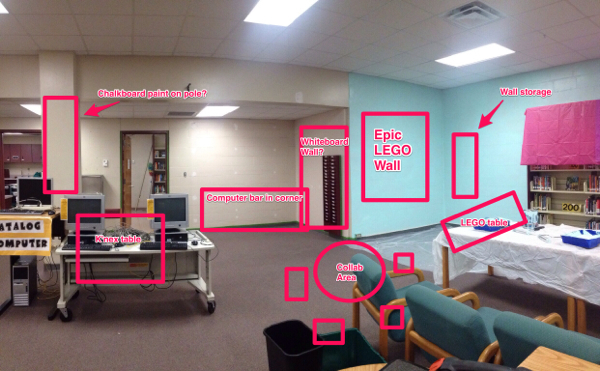 A few days ago, I tweeted out this image of our future Makerspace that I created in Skitch on my iPad. I was inspired by The Nerdy Teacher’s post on rethinking his classroom setup, and I wanted to create a visual that could show what our space will be like when it all comes together. I got a really positive response to my tweet, so I decided to write a more detailed post to help explain what we’ll be doing. I’ll keep posting more updates as everything comes together. I want to provide many collaborative spaces in our Makerspace for students to work together, create art, and brainstorm. Before the school year wrapped up, I put together a Makerspace planning committee made up of students who wanted to help plan things (they also planned our mini-Makerfaire). I talked to them about whiteboard and chalkboard walls, and the general consensus was that they wanted to have both types of areas available. I see the chalk area as more of an art space, and the dry-erase as a more collaborative space. I plan on creating a DonorsChoose project at the beginning of the year to get the supplies to create this. From the very beginning of intentionally bringing Making into the library, the K’nex have been a key component. My students LOVE to tinker with the K’nex, and we had great success with our K’nex club last year. I want to have a dedicated area where students can always have access to them, even when we have bookfairs, special events, etc. This will be two tables put together for now, but I’d eventually love to get an Interior Concepts collaborative table and some easy-access wall storage for the K’nex. We’ve always had a few computers in this corner, and my students love to use them when they come to the library on a pass. They like being separated from the larger computer lab where we have classes, because it gives them a little more privacy. We’ll be adding a third computer to this area, and the computers will be on a cafe-height table with stools to make it easy for students to switch from looking things up to tinkering. I’m planning on keeping coding resources in this area too. As with the chalkboard pole, the whiteboard wall will provide another area for collaboration for students. I may eventually move the magazine racks to a different location, but my students like having them here, and we subscribe to a lot of good magazines for a Maker Corner, like Make magazine and Wired. This is really a set of comfy chairs and a low table on casters. 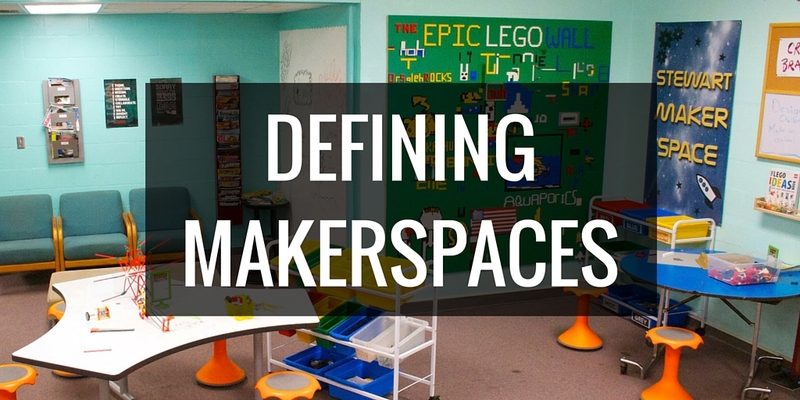 My students LOVE hanging out in this area, and I don’t want to take that away from them as we create our Makerspace. I might use dry-erase or chalkboard contact paper on the table to gear this area more towards a collab space. Inspired by this Pin, we will be creating a giant wall mounted LEGO space. We had a coding club in the spring that worked through the Code.org curriculum, and DonorsChoose was running a promotion where you received a $750 credit if 15 of your students completed it. 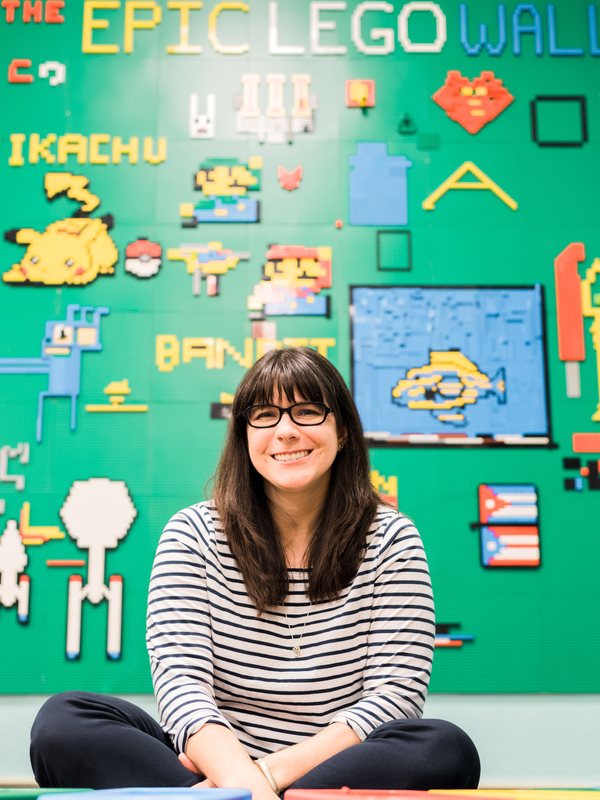 This allowed us to fund a tricked out LEGO wall project. We’ll be gluing 36 baseplates to a 60×60 inch sheet of plywood, then mounting that to the wall. My students are SO excited about this. It’s going to be epic. We’re going to need a place to store all those LEGOs for easy access, so we’re getting some nice wall-mounted storage that will work for both the wall and the table. It’s good to have horizontal and vertical spaces for tinkering with LEGOs, so we’ll have a table over here for that. We’ll be mounted a few baseplates to the table, and I’m going to see if our shop teacher can help us create a recessed storage space in the table for easy clean-up. Keep posting! I am following you on IG and now google groups. I am part if an innovation grant in my district and will be attempting something similar. I love seeing what you’re doing! Love it! Look forward to seeing it come to be and sharing our progress with you!